Have you ever been stuck in a traffic jam and wanted to check your email or the weather? With the Ca-fi you can do all of this and more. While you’re driving you can stream music, get GPS navigation, or talk with your friends and family (and not-so-friends) with hands-free calling. There are also many other features/apps that probably shouldn’t be used by drivers (angry birds, fruit ninja, web browser) but, could be very useful in a parking lot, driveway, etc. All of the models have 6.2 inch capacitive 800 x 480 touch screen displays and allow users access content with its 3G dongle. The system also includes a dual-core 1.2 GHz processor. Some functionality relies on having a separate android device (the system has bluetooth). 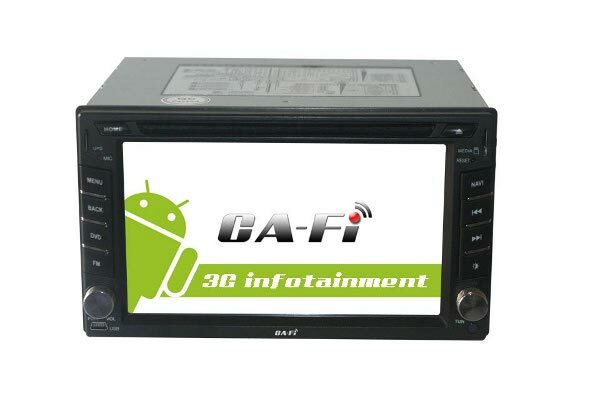 But, the infotainment device also carries some of its own features that don’t need an external android device. The Ca-fi product line has multiple models available that fit different major automobile brands such as Mazda, Ford, Toyota, Honda, Chevrolet and Kia. They range around $700 – $900.